This post is about politics, racism, murder, and statistical numeracy. Now there are all kinds of questions this should raise. Why in the world would the RCMP and Minister Valcourt be sharing this kind of data in private? Paulson himself claims, “It is in the spirit of our bias-free policing policy that the RCMP has not thus far disclosed statistics on the ethnicity of the perpetrators of solved aboriginal female homicides.” Right. So in the spirit of being bias-free, they only discuss these statistics with politicians. Quietly. Until the politician chooses to use that statistic for political leverage. Seventy percent certainly sounds notable. And it is, although it isn’t really surprising given that domestic violence is the most common case for all murdered women in Canada. But thirty percent of a Shockingly Disproportionate Number of even the solved cases is still significant. Being only 30% doesn’t let white guys* off the hook. The RCMP already released a report on MMIW in 2014. It has some useful information, although if you need a trigger warning on racist stereotypes and victim blaming maybe don’t read it right to the end. Unfortunately we have some question marks! Because naturally Valcourt didn’t say anything about how many non-Indigenous murder victims were killed by fellow non-Indigenous people. Still, that 269 total is not a small number, even without however many of the 120 unsolved cases also belong there. Now the total number of non-Indigenous women killed is a lot higher. But that’s not surprising since Indigenous women only make up 4.3% of Canada’s total female population. This also means that comparing totals is not incredibly useful. What does this show us? Well for starters, it highlights how much more of an issue this is for Indigenous women than for the rest of Canadian women. An Indigenous woman is over four times as likely to be a murder victim than other Canadian women. Valcourt’s dropping of the 70% bomb was intended to deflect blame. Canadian voters, I assume he assumes, aren’t interested in shouldering the nation’s responsibility for the legacy of the residential school system and other arguably-genocidal acts we’ve committed in recent history. We’d much rather just push the blame onto the Indigenous population! That’s right, it’s all your fault. Now, there’s no avoiding that domestic violence is a real part of the equation here. This was already known and there’s some concrete data in the RCMP report. Despite the fact that a smaller ratio of the murders of Indigenous women were done by a spouse or other family vs other perpetrators than in other cases of women murdered, the risk of domestic/family violence is still the largest overall risk for Indigenous women (as with Canadian women in general). But is the larger amount of domestic violence in Indigenous families the only issue? Is the cause that Indigenous men are more violent? If this were the case, we would expect to see significantly smaller proportions of MMIW cases being caused by people outside the family. However, the opposite is true. Numbers are higher across the board, and murders caused by someone outside the family are actually a much higher percent of the cases for Indigenous women. Using the per-hundred-thousand section, we can see that Indigenous women are more at-risk of being murdered by an acquaintance than a white woman is of being murdered at all. That’s already a pretty bad sign. Now let’s look back at that first table. What can we say about the 30%, despite the blanks? 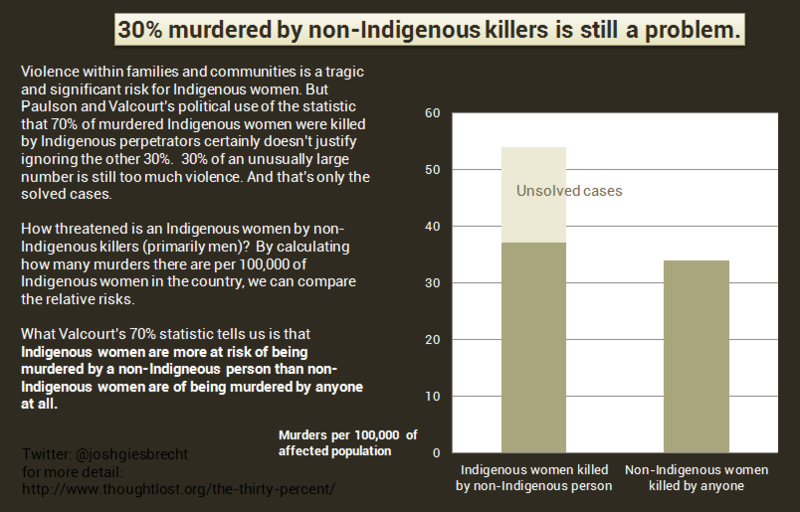 Thirty-seven Indigenous women murdered per 100,000 by a non-Indigenous killer, vs. thirty-four non-Indigenous women per 100,000 murdered at all. And that’s without even including any of the unsolved cases, which I’d assume includes some (if not a lot of) non-Indigenous murderers. Indigenous women are more at risk of being killed by a non-Indigenous person than other Canadian women are at risk of being killed by anybody at all. Ugh. You guys, I think it’s safe to say that us colonizers are still a part of the problem. So let’s not pretend that Valcourt’s 70% lets white-male Canada off the hook. Nor does it excuse the government from listening to the call for a large-scale inquiry into the large-scale systemic problems. That 30% still looks an awful lot like violence influenced by racism. * Sorry, I mean, “Non-Aboriginal perpetrators”. ** I’m using total number of murders over the past 30-odd years included in the RCMP report and then using the current population totals. Potentially wonky, but unless that 4.3% has changed drastically over the last 30 years it should still be fine for making comparisons between groups. ps. Yes, I noticed later that Paulson said that 25% are non-Indigenous, and 5% are unknown. I’m not going to bother editing for that because, meh, if it’s unknown then most likely they were non-Indigenous; remember, 4.3% of the population. pps. Some of the “totals” listed for unsolved cases are calculated from the RCMP report’s stated percent-solved, which was a hand-wavey 90%-ish. They’re more than accurate enough to compare situations between groups, but don’t quote them down to the last digit.